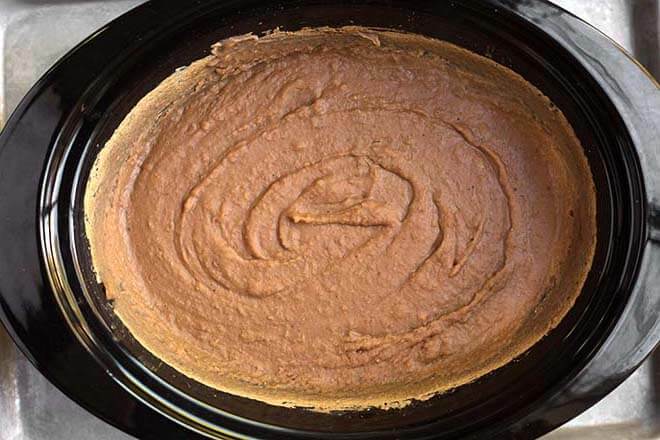 Slow Cooker Refried Beans are incredibly delicious, and so easy to make! They are flavorful, healthy, and taste much better than the canned stuff! These crock pot refried beans are a dump and start style recipe, so you can get them in the crock faster! I think next to my Instant Pot, my slow cooker is my favorite kitchen appliance! When I haven’t used it in a while, then make a meal in it, I wonder why it took me so long to take it out and use it again! I work strange hours, so cooking something in my slow cooker is often the way to go. 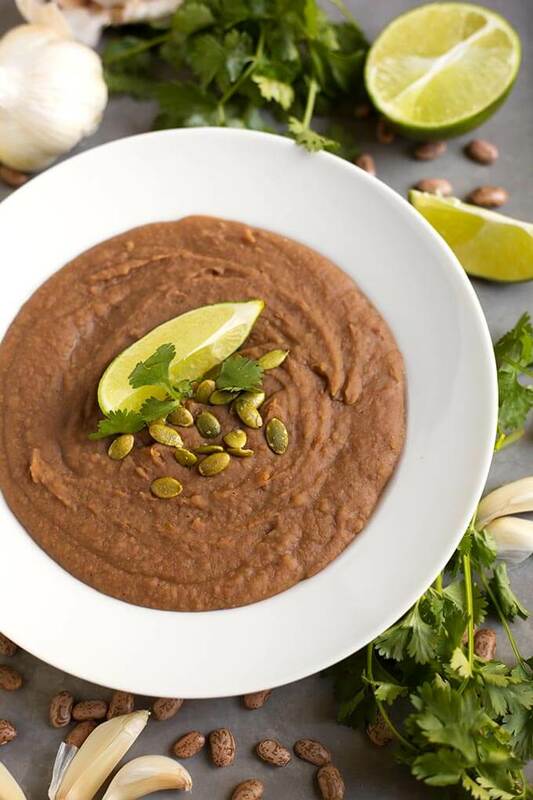 Even better when it’s a “dump and start” recipe, like these Slow Cooker Refried Beans! I can let them cook all day while I run around or have a project to finish. 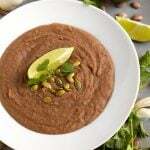 I have made a version of this refried beans recipe in my Instant Pot (Instant Pot Refried Beans), but thought the crock pot would be a perfect alternate cooking method for that recipe. I had to make a few tweaks, but they turned out just right! You don’t have to soak the beans if you don’t want to. I never do, I just rinse and sort them, and in the pot they go! Easy! And they aren’t actually “refried” but they taste just as good. Slow Cooker Refried Beans are great in burritos, tacos, 7 layer dip, served alongside rice, and on their own as a delicious side dish. I love the ‘set it and forget it’ style of cooking! You can come home and have part or all of your meal ready to go! And your house will smell so good! When the beans are done, just use an Immersion Blender to puree them nice and creamy. Or use a potato masher if you like them coarser. 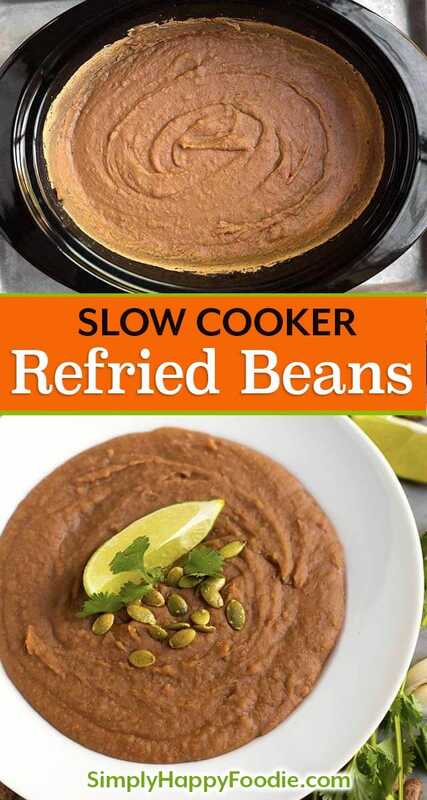 Slow Cooker Refried Beans are about as easy as a slow cooker / crock pot recipe can get! The flavor of these refried beans is so much better than the canned stuff! Just dump in the pot and go! Rinse and sort the pinto beans. Add to the slow cooker. Add all remaining ingredients to the slow cooker and stir. Put the lid on and cook on High for 5 hours, or Low for 8 hours. When done, use an immersion blender to puree the beans. You could use a potato masher if you like the beans coarser. Garnish as desired. Some options are pepitas, cilantro, sour cream, lime, Cotija or other cheese, avocado, or salsa.